(PRLEAP.COM) LONDON, UK - Creative Virtual, a leader in customer experience self-service solutions for global enterprises, will be hosting a webinar on Wednesday, 26 March 2014 starting at 15:00 UK time (11:00 AM ET / 8:00 AM PT). The event has free online registration and will feature the following speakers: Kathryn Daniels, Information Development Manager at National Rail Enquiries; Alison Chapman, Communication & Development Manager at Motability Operations; Maria Ward, Head of Web Services at The Virtual Zone; and Chris Ezekiel, Founder & CEO of Creative Virtual. Natural language virtual assistants are becoming the go-to solution for organisations looking to enhance their customer experience and provide accurate, consistent and personalised customer service. The flexibility of these smart help solutions make them the perfect match for everything from providing 24/7 self-service options on a website to delivering support on social media platforms to assisting live agents in customer contact centres. Since 2007, both National Rail Enquiries, the definitive source of customer information for passenger rail services on the National Rail network in the UK, and Motability Operations, the not-for-profit organisation which runs the Motability Car and Powered Wheelchair & Scooter Schemes, have used virtual assistant technology as part of their customer experience strategies with great success. 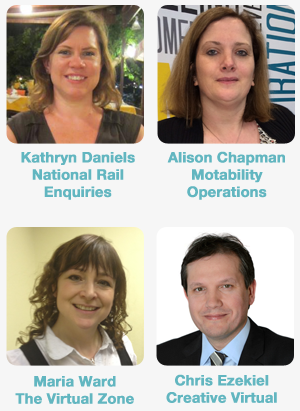 Join Kathryn Daniels from National Rail Enquiries, Alison Chapman from Motability Operations and Maria Ward from The Virtual Zone for this webinar as they demonstrate the power of smart help through live examples, share real results and give an inside look into how their organisations use conversational natural language smart help solutions to meet customer experience goals across multiple support channels. Kathryn and Maria will show how NRE's Ask Lisa is providing 24/7 self-service across their website and Facebook pages. Alison will focus on how Motability Operations uses the technology internally for knowledge management and support of their advisors within the contact centre. This webinar will benefit professionals involved in customer experience/engagement, self-service, customer service, contact centres, sales and marketing looking to hear real reviews and see practical examples of this technology. "National Rail Enquiries and Motability Operations are both great examples of organisations using well-established conversational natural language solutions to successfully meet very specific customer experience strategy goals," says Chris Ezekiel, Founder & CEO of Creative Virtual. "This webinar is a chance for companies looking to enhance their own customer engagement to see first-hand how this flexible smart help technology can support those objectives, whether deployed as a public-facing solution or used internally." More information about this Creative Virtual sponsored webinar and the link to register can be found here. Creative Virtual is a leader in self-service customer experience management solutions for enterprises. Global organisations like HSBC, Verizon, CA Technologies, E*TRADE, Lloyds Banking Group, Renault and National Rail Enquiries rely on our technology to optimise their customer support, sales, marketing and call centre teams, reduce costs, increase online sales, and achieve operational excellence across mobile, web, and social media channels. Since 2004, Creative Virtual has built the most advanced technologies in knowledge management, natural language processing, and virtual assistants to help businesses deliver intelligent, personalised customer experiences that reduces email and call volume, builds brand loyalty, and increases customer engagement at a lower cost per conversation. Delivering accuracy of over 90% and call deflection of up to 50%, our platform is the most compelling self-service product in the world today. For more information about Creative Virtual solutions, products and software, please visit our website at www.creativevirtual.com.